A joint team of the Institute of Vertebrate Paleontology and Paleoanthropology (IVPP), Chinese Academy of Sciences, and the Preservation Center of Cultural Heritage in Tianjin found a new paleolithic site at the Sungezhuang village, Jixian County, Tianjin City, China in April 2005, and a total of 58 stone artifacts were unearthed. Researchers reported their findings in the latest issue of Acta Anthropologica Sinica 2013 (1). The new paleolithic site was buried in the second terrace near the Prince Mausoleum of the Qing Dynasty, and was named the Taiziling Paleolithic locality. Three stratigraphic layers of the second terrace were identified at this locality with a total thickness of more than 1 m. Archaeological materials were mainly collected from the 2nd layer, a light yellow silt with gravels 0.3-0.5 m in thickness. The stone assemblage includes cores (n=5), flakes (n=42), chunks (n=5) and retouched tools (n=6). 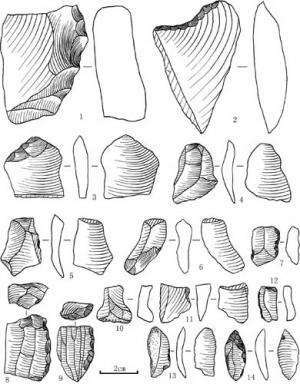 Lithic raw materials exploited at the locality were locally available from ancient riverbeds, with chert being the predominant raw material (72.5%). The principal flaking technique was direct hammer percussion with core preparation, especially for microblade cores. Most stone artifacts were standardized in shape, finely retouched and small in size, and most tool blanks were flakes. Only three retouched tool types were identified: scrapers, points and picks. Modified tools appear to be retouched by hammer percussion and pressure techniques, with tools retouched primarily on the dorsal surface. "It can be inferred from these materials that this stone assemblage shows a close relationship with the Flake Tool Industry (Main Industry) in North China, but bears some characteristics of the Microblade Industry there", said coauthor SHENG Lishuang, an archaeologist at the Preservation Center of Cultural Heritage in Tianjin. Geomorphological and chronological comparison within Jixian County indicates a Late Pleistocene or Early Holocene date. 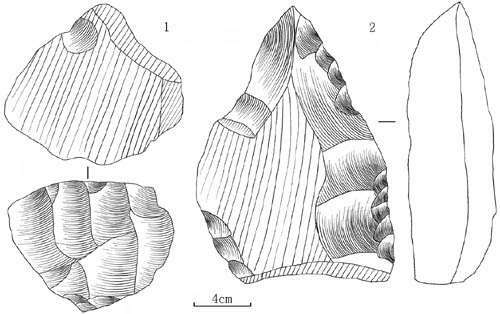 "The Taiziling locality provides important data for the study of human adaptive strategies and patterns in this region, and offers evidence for the study of lithic techniques in the Late Pleistocene/Early Holocene in North China as well as the cultural relationship between northern and northeastern China during the Pleistocene", said first author Dr. WANG Chunxue of the IVPP.